The recent Logan Symposium, organised by the Centre for Investigative Journalism, brought together leading journalists and activists to debate the threats posed by Secrecy, Surveillance and Censorship, in the wake of the Snowden revelations that shone light on the murky world of global surveillance. What became clear, though, is the extent to which the public remains the dark. John Pilger highlighted the fact that the so-called information age, is actually what he called the media age, and that the information we have access to is so often distorted and manipulated, with the aim of deceiving, rather than revealing. Furthermore, the worst culprits, in Pilger’s view, are the mainstream liberal media who profess objectivity - who claim to tell the truth. It wasn’t just Fox News that published ‘evidence’ of Sadam Hussein’s weapons of mass destruction; trusted papers like the New York Times also accepted what they were told without proper scrutiny, and the public believed them. For a long time the media have had significant control over the construction of the narratives that shape our society. The media ask the questions, and decide the parameters of debate; they legitimize some voices, and ridicule others; they decide who should be heard, and who should be silenced; which corner of the world we will peer at through our TV sets, and which war torn country will slowly but surely disappear from view, out of sight, and even further out of mind. But has the rise in prevalence of user generated content in any way checked the influence of the ‘media’? Does twitter allow new voices to be heard, and new stories to be told, shared and received directly? 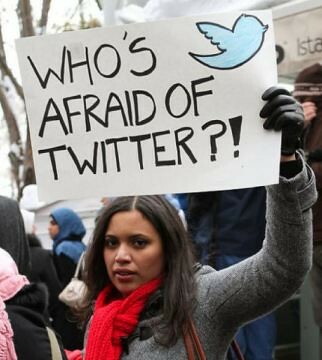 Much has been said and written, for example, about the role of social media in the 2011 uprisings that shook the Arab world, branded by some as ‘twitter revolutions’. Demonstrators in Libya, Tunisia and Egypt shared photos and videos of what was happening on the ground, spreading the word and gaining the world’s attention. But it has also been argued that the claims for the power of social media have been wildly overstated. Indeed, there have been claims that the wider media hijacked the narrative of these revolutions, choosing to focus overly on the technology and not on the people and their cause. After all, when the internet went down in Egypt, people continued to take to the streets. What’s more, the attention of the world has drifted away from these countries even as the unrest continues, and the ‘democracy’ they fought for seems a more elusive goal than ever. Yet it seems as if the internet is opening up new opportunities for discussion, debate and the sharing of information freely, abroad and closer to home. Here in the UK our own political system is also being challenged. The recent Scottish referendum on independence saw unprecedented levels of political engagement, especially amongst young people, as the UK came close to huge constitutional upheaval. Scotland was energized and everyone wanted to be a part of the discussion. Much of the campaigning happened through unconventional channels, and many of the conversations and debates took place on social media. The internet clearly has the power to open up a discursive space, and perhaps it can offer opportunities for groups alienated from the political process to be engaged and involved. As more powers are devolved to the Scottish Parliament and other regional governments, we may well also see power decentralized in other ways. Important and influential debate may begin to shift away from Westminster’s hallowed halls, and the BBC’s studios, and onto internet forums, where more voices can be heard. This week’s episode of Question Time, billed as an epic showdown between Russell Brand and Nigel Farage, came and went without living up to expectations. The audience was unusually lively, but even the program’s uncharacteristic disorganisation had a studied air. One sensed that the chaotic atmosphere was itself carefully planned - like the politicians’ all too well prepared answers. The sterile forms of debate so often witnessed on such television programs are beginning to seem tired and limited. It’s time to ask new questions about the way our democratic processes can be improved and updated. People are even beginning to consider the possibility of going further than just sharing information and ideas on social media. Why not develop a system allowing people to actually vote via social media? However, though the internet offers tremendous opportunities, it can also be a dark and unforgiving place. Online freedom has brought with it dangerous unaccountability, opening the door to torrents of abuse the like of which we have seen unleashed on figures such as Mary Beard and others who have dared to speak out. It has become a haven for so called ‘trolls’ intent not on contributing to discussion, but on silencing others with often graphic threats of violence. Indeed in our hurry to embrace the brave new world of technology, we are perhaps in danger of ushering in a new age of even more pervasive censorship, where those who share thoughts and ideas are judged and sentenced online by an anonymous and un-elected mob. The internet is transforming the way we interact and engage with each other and the world around us, what remains to be seen is whether this will lead to a more democratic and open society, or whether we are heading towards realizing some of the darker dreams imagined by dystopian fiction.